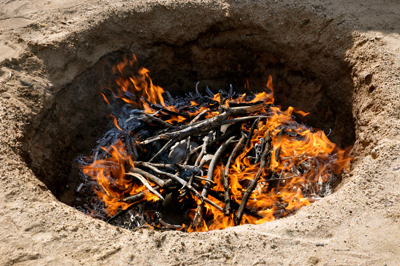 I was aware for many years that the pit firing ceremony would be the most appropriate firing method for my work but it was only when I moved out into the desert of Southern Arizona that everything fell into place to begin the grand experiment: an exciting balance of control and blind bargain. I had been making pots for weeks and there was no kiln in sight. I had never pit fired nor seen anyone else pit fire, so I was apprehensive to say the least. I went out to walk and pray in the desert and visit an old grandfather saguaro… on the way back I heard Spirit say, “All you lack is experience.” I knew it was the answer to my prayers. There was only one way out, I would be required to move forward on faith. My first pit firing was a very surprising success! My second pit firing showed me in no uncertain terms the potential this humble, simple technology held.